Cauliflowers look like gigantic snowballs dontchya think? And coconut, like little snow flakes. I do like to try new things, but typically I like my cauliflower whipped and warm and served up with my good friend, cheese. But this is a great way to detox AND get in some healthy nutrients this holiday season; and it’s hardy enough to keep you sated through out your holiday parties! The lemon helps detox your system (too many spiked egg nogs?) The coconut meat contains gobs of vitamins and minerals, and even has enzymes to help aid in digestion. 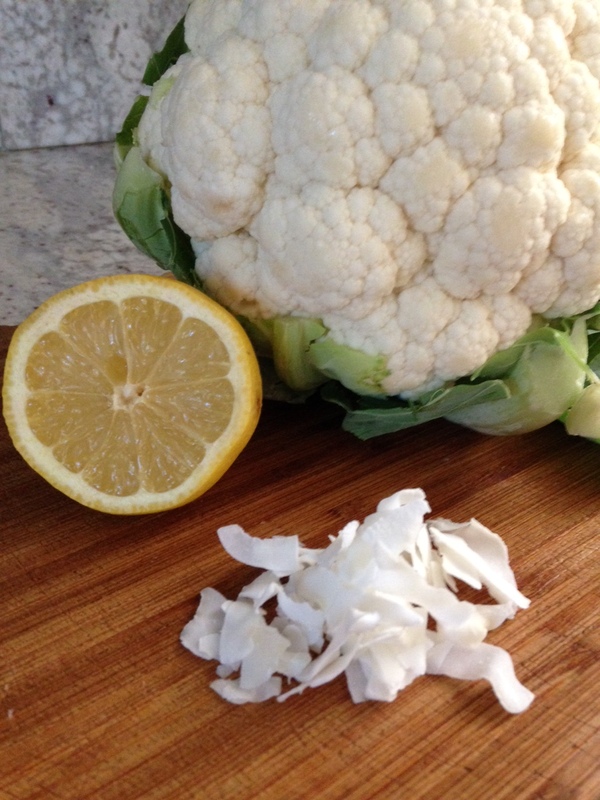 The cauliflower has heaps of nutrients, like vitamin and vitamin K, and also boosts the anti-inflammatory, cancer-fighting, power of this mix. If you are feeling extra sassy, you could use less liquid, which’ll thicken your recipe; then scoop little snow balls and top with shaved lemon rind!